Greetings Knights! February is getting closer and closer and with it the beginning of our Kickstarter campaign for Waste Knights: Second Edition. You can count on us publishing new materials about the project so that you learn more before you decide to back its creation. Last time we told you a little about various threats awaiting you in the wasteland. Now we wish to focus on a subject a little less tangible from the perspective of game mechanics but of utmost importance for the mood – the story itself. You will learn a little about the structure of the scenarios, footnotes and choices you will make when playing. When you open the box with Waste Knights: Second Edition, besides figures, custom dice, cards, sheets, and a pile of tokens you should also find 3 booklets there. The first one (and the thinnest not to tire you too much) is the rulebook. The second one is the Guide while the third one – the Book of Tales. After you have done a simple basic setup and chosen your characters (that should take 10 minutes at most) you will be able to decide what story you wish to experience. The Guide features a few Scenarios constituting the heart of the game. Each has a different theme and a unique subject. A scenario is comprised of a number of Plot Sheets. They are used depending on your progress in the game. Right at the beginning, when you set up the scenario, you plunge head-first into adventure. New game elements matching the narrative path you have chosen are introduced into the game as you play so that the story is smoothly intertwined with game mechanics and you are not bored with long preparations. As you fulfill the goals of the plot you are currently resolving you will realize that the story branches out further and further, forcing you to face new challenges but at the same time letting you upgrade your knights and gear. In the end, you will reach one of the climatic finales, its kind depending on your earlier successes or failures. What is important, at the beginning of the scenario you will not know anything about its goals or challenges. You will follow the story evolving with every choice you make at different stages of the game. While the Guide is primarily used to lay down the game mechanics for a particular plot – a framework of sorts – the Book of Tales enriches it with narrative layers. 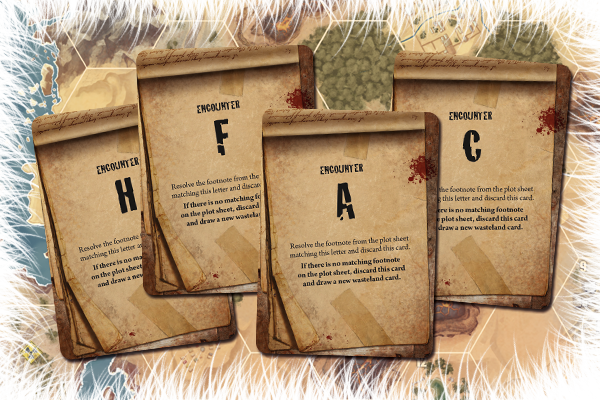 In it you will find hundreds of Footnotes to which the Guide and the Encounter Cards from the wasteland decks relate. Somehow similarly to scripts from This War Of Mine: The Board Game, footnotes will give you an actual chance to affect the story but they will be richer with game mechanics and more advanced in its narrative scope. Each of them will make you choose 1 option based on the mindset and skills of your knight and then face the consequences. Sometimes your success will depend on tests, sometimes you will have to resolve combat or sacrifice certain resources. Some options will only be available in special circumstances: if you play a particular knight, own special gear or move using the required vehicle type. 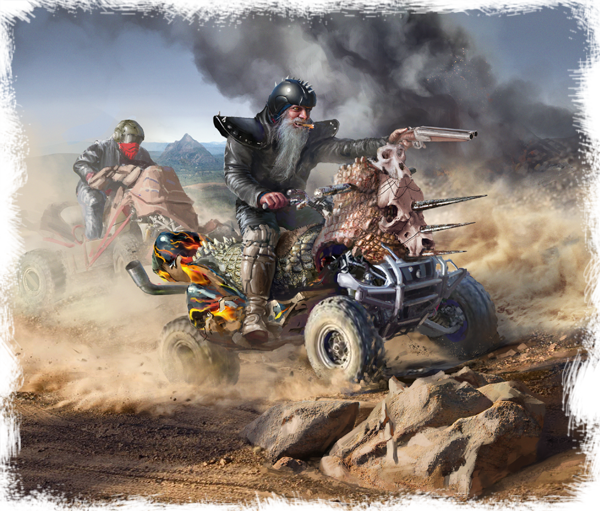 After all you must admit that the Mechanic is much better at resetting an old wind farm than the Aborigine Spirit Warrior but the latter knight will quickly find common ground with a shaman or subdue a rabid dingo. Footnotes are also important for another reason – the guarantee replayability of scenarios. Thanks to them even when you choose the same plots again, you will not experience boredom or repetitiveness, while the cards governing the footnotes almost every time open new possibilities and give you access to fresh stories. 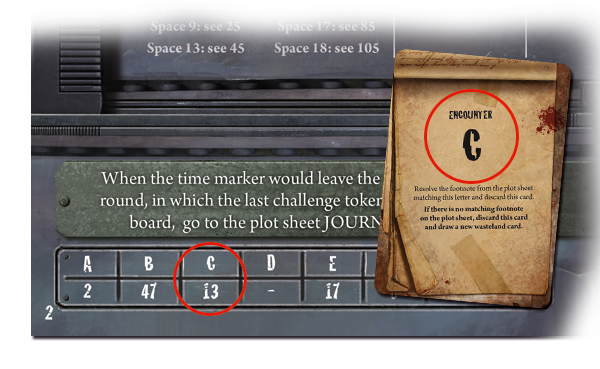 Additionally, each scenario encompasses both unique footnotes connected to its game mechanics and theme as well as random footnotes from encounter cards offering you even more varied gameplay. Finally, it is worth mentioning that narrative materials should provide you with hours of fun. Just the first scenario that we are using for playtesting purposes encompasses around 80 pages of text. Of course in order to learn the whole storyline you would have to play it 3 or 4 times and be hellishly lucky when drawing cards because during a single gameplay you will experience only a part of the narrative. However, this should give you a vague idea how complex the setting of Waste Knights: Second Edition is and how deep your characters can immerse themselves in it. 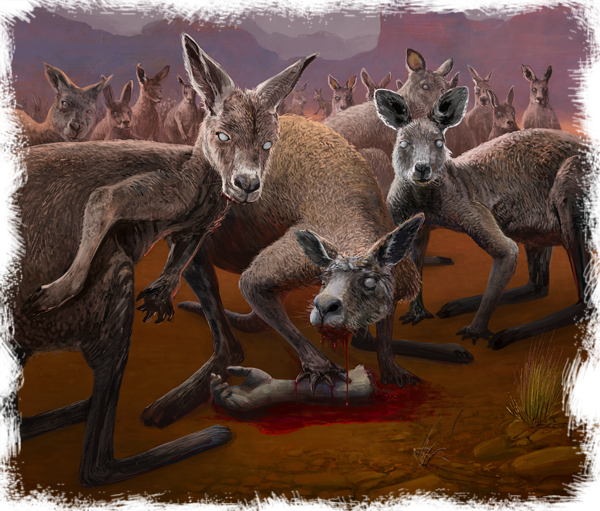 Considering that each tale from the Waste is unique and each can be played with a different group of knights, we wish to give you one more tool – the Outback Chronicles. It is a notebook of sorts inside which you will write down the most vital information regarding the scenario you are currently playing: the tasks you fulfilled; unique rules discovered during the game; effects of gear and NPC created using Footnote Tokens; key terms giving access to new plot twists; finally Epilogues that you will read after the game to narratively wrap up your accomplishments. This way after a few games you should have a genuine diary from ruined Australia, with you as its authors. 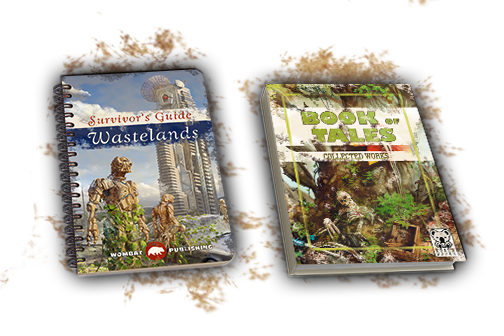 We believe that the stories we are preparing for you when designing Waste Knights: Second Edition will be engaging and thrilling. Whenever we start another day of work on the game we embark upon a new journey and discover things we had no idea of the day before. We hope you will share with us this passion and any adventures you experience will be unique thanks to your decisions and engagement. We encourage you to follow our social media pages and internet sites where we publish new materials about the game. 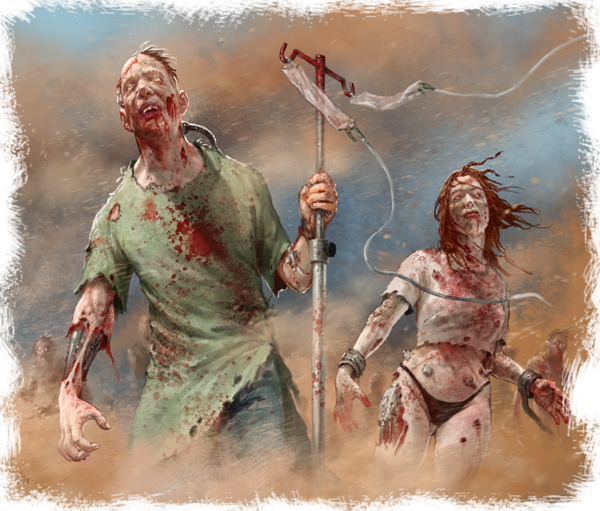 You might also check Board Game Geek and become fans of our game. In February 2019 you will have a chance to back Waste Knights: Second Edition on Kickstarter! Important: Terms and graphic materials used in the text are not final.